I've mentioned in previous posts my interest in simplicity. Lately, I've been pondering how I can simplify my life, pare down my possessions and live more purposefully. Over the last year or so, I've also been grappling with social justice and how to live a good life without diminishing the lives of others. I stumbled upon Richard J. Foster's Freedom of Simplicity: Finding Harmony in a Complex World while searching my library's ebook catalog for another book with "simplicity" in its title. I devoured this book in three days and feel like God must have arranged it that way! "Freedom of Simplicity," despite being originally penned in the late 80s, felt so current and resonant to me. 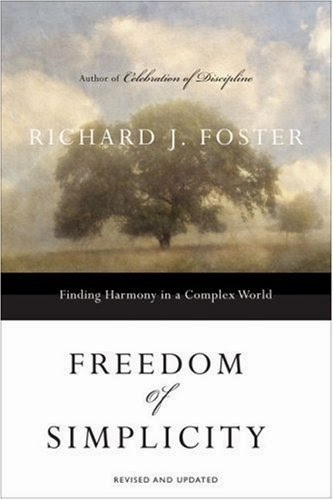 Foster spends the first portion of the book putting the idea of simplicity within the context of discipleship and seeking the kingdom of God first. He emphasizes the need for having a single eye for Christ (Matt 6:22) and striving to find ourselves in Him, or in obedience to the "Divine Center," as he puts it. The author takes readers on a whirlwind tour of Christians through out history who practiced the spiritual discipline of simplicity to show that intentional living and Christian minimalism aren't new concepts. I found myself highlighting the names of theses saints who went before, eager to learn and read more about their lives. After a rather lengthy disclaimer that simplicity will look different for each individual based on the specific place, time and ministry in which God has placed them, Foster takes a risk and opens up a world of specific examples of what simplicity might look like in our lives. He touches on the culture of consumerism, materialism, busyness in order to be approved by others, unsustainable habits, exaggerated speech, social injustice and environmental destruction, all of which prevent Christians from a simple, single, effective walk with Christ. I won't lie, some of his proposals made me squirm... especially the chapter on finances, but through it all, I felt my heart nodding slowly in agreement. I want to unpack some of the things Foster writes in my next post and some of my own ideas spurred by the practical suggestions he offers for living blamelessly in the world, but not of it. I would love to get together with some good friends and digest this book in community... anyone interested?